Here we have the Blaze of Glory Shark Pack. 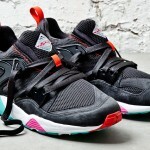 Sneaker freaker and Puma have teamed up and gone back in time by 5 years and have brought back their 2008 Blaze of Glory Shark Pack. Both of the ‘Black Beast’ and the ‘Great White’ are scheduled for release on the 30.11.13. These crepes will be released globally and are available at UK stockists such as End and Foot Patrol.